This will be my first game play report here. This game and may past games can be seen at Fencing Frog. My friend Luke is home on leave from the Marines. He always like to get in a game of Flames of War, so I was happy to host. My dining room table is a bit narrow but I hoped that would lead to a fast result and maybe get us two games. I was half-right, but traffic kept us from getting in a second game. I had the table set and ready to go. This is important when playing host because set up of a game table can take a little time. One has to get every thing out, set the terrain up, and then look at it to make sure it’s balanced. I may have crowded the board but I wanted to provide plenty of cover for both sides as Luke was playing Soviets, and trained troops in the open are just so easy to hit. There are other key preparations that need to be handled before fellow players arrive. In my case, my girlfriend Ariana had put out a list of demands–I mean cleaning tasks–she wanted done before my guest arrived. I laughed because the apartment is clean (spotlessly clean compared to many game stores; normal clean for an apartment), but I did make a quick sweep and wiped down the counters. I’ll probably get in trouble for mentioning this as one of my instructions was to throw out the list. Well, it can be our little secret. We played a “free for all” mission. I had first move but other than advancing my infantry to cover an objective better I didn’t move much. 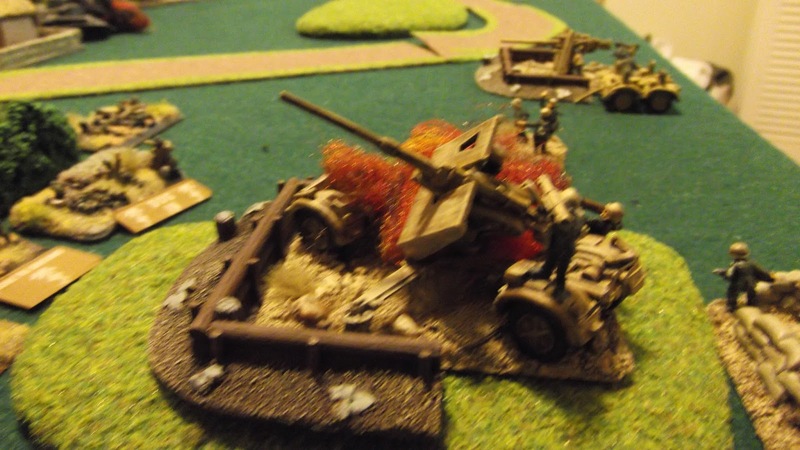 I drew first blood with my 8.8 AA guns killing a T-34/76. Luke got two of my Neblewerfers and two infantry men with his tanks’ MGs. On turn two, I had some really good luck and smashed both Luke’s T-70s and his T-34/76 platoons. 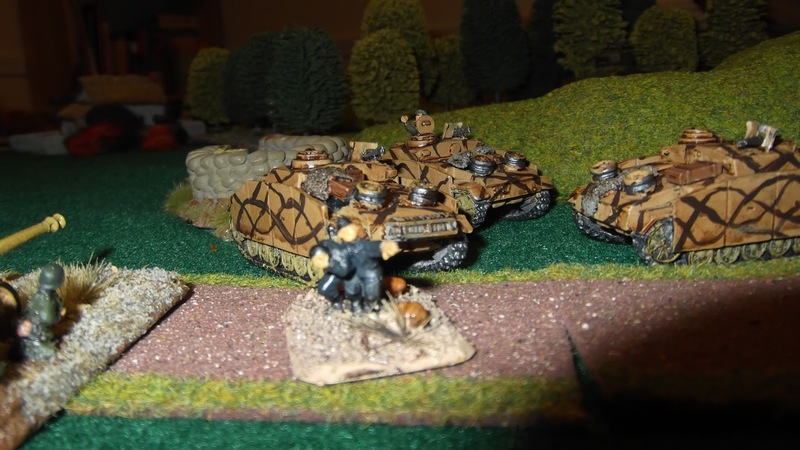 Luke did manage to bail a StuG (Luke’s dice were very unfair to him) with his T-34/85s on my right. 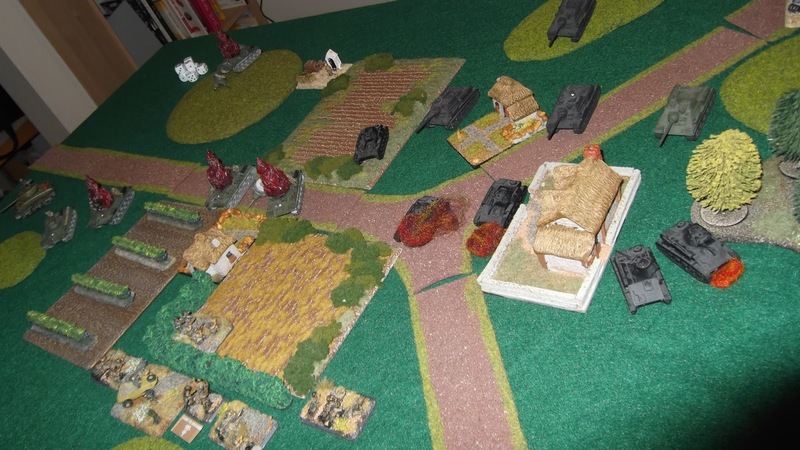 He also made a bold flanking move with his HQ and lone surviving T-34/76 on my left. They missed their side shots, unfortunately for him. 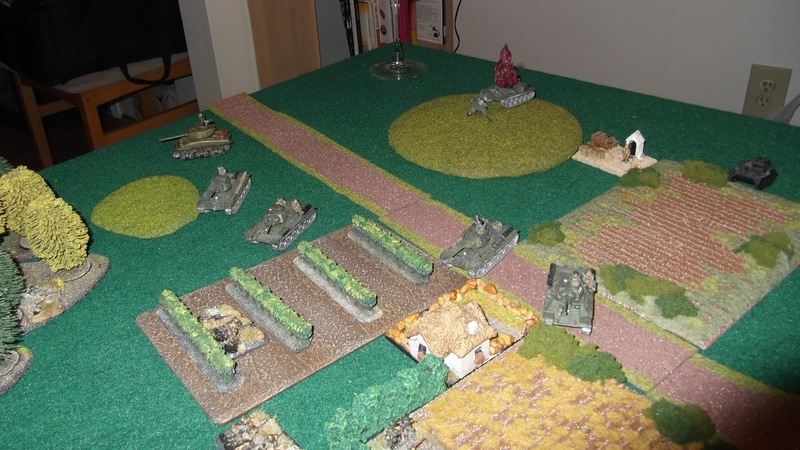 I got the HQ on the next turn though I lost a StuG in the process. Luke was in dire straits but still game to get at me. 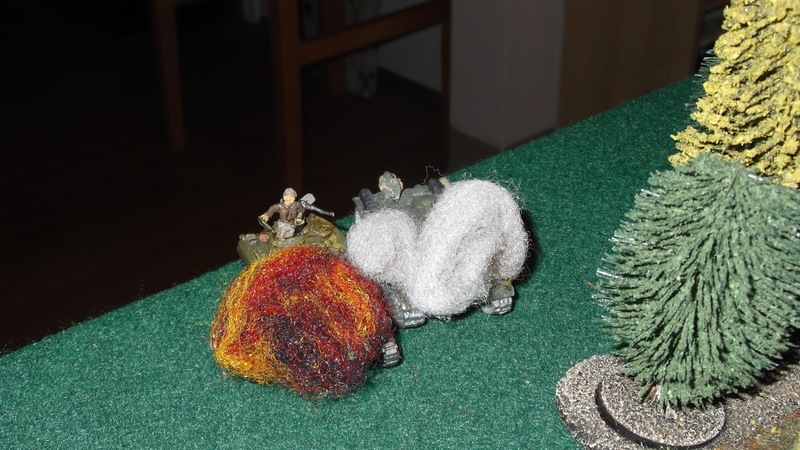 Luke got one of my 8.8 Flack guns with shots from his SU-85s but on the following turn my StuGs–with the help of a PAK 40–killed his T-34/85s. By this point it was getting late. We considered switching sides, but in the end decided against it. We spent some time discussing other approaches Luke could use. He’s always eager for tactical advice (even more so since the military is his profession). My big suggestion was to use his light tanks on the flanks not the center. Some heavy tanks that could absorb more hits would also be a good addition (this was actually Luke’s own idea but I endorse it). It was great to see Luke and I hope we can get in at least one more game before Luke heads back for his next deployment.